Born in the mid 70s, the paraglider is a kind of parachute, but with a different launching method (by running, instead of jumping), and its longer shape is more aerodynamic that of a parachute. 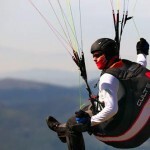 The paraglider is the simplest flying machine ever invented, as an experimented pilot can easily explore the ascending air mass in order to keep his altitude. 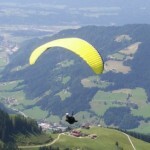 Regarding the paraglide, the flight principle is different from that of a parachute, as the launching begins by a run on a slope, until the glider wing, that has initially been laid on the ground behind the pilot, inflates and rises above, able to lift the paraglide off the ground. Once in the air, the pilot can control the wing and the choose the direction he wants to go. It may seem surprising, but you will feel that you are completely supported by the wing, and even the ones who generally suffer from vertigo will most probably feel at ease. It is like the difference between looking out from the window of an airplane and standing on the very edge of a cliff. In optimal weather conditions, a paraglider can fly for many hours and on long distances. 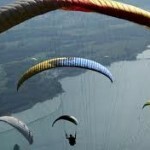 The world record is of 500 km, and in Romania is of 200 km in about 6 hours flying. The glider is made of several distinct elements. This is made out of two parts, the upper surface and the lower surface, joined together by several vertical membranes called ribs, which gives the wing the aerodynamic shape. The cells that form between the upper surface and the lower surface are opened to the front part in order to allow the air to come in, and are closed at the rear part. Also, the ribs have small holes in order to allow the air pressure to be uniformly distributed in all the cells of the wing, thus increasing the rigidity and the stability during the flight. The wing is made of very light polyester or nylon (35 – 40 g/mp), is waterproof and has resistance coefficients. Is a complex system that ensures the comfort during the flight, and also protects the pilot in the event of a harder landing. On the one side of the harness, under a special cover, there is a backup parachute, essential in higher flights, in mountain areas where weather is unstable. Between the wing and the pilot harness there are the lines, which support the weight of the pilot by the connection point with the wing, and also help the wing take its aerodynamic shape. 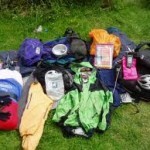 The equipment is completed with overalls to protect against winds during longer flights, gloves. A helmet is mandatory, to protect the pilot in the event of an accident or harder landing. Tracking boots are also recommended to avoid ankles injuries. Other optional accessories are a GPS, Altivario (for measuring the height and the pressure variations to make out the vertical speed), and a radio station. The glider does not weigh more than 15 kg and it fits into a back pack that can be easily carried. Both the speed and the altitude can be controlled by 2 control handles. The medium flight speed is about 35 km/ hour. When there is no wind activity, the glider can fly with about 9km at a height of 1000m.